Researchers from Tianjin University in China recently released results from a study that showed the results of the use of an anaerobic/aerobic permeable reactive barrier at removing tetrachloroethylene (also known as “perc”) and its intermediates in groundwater. 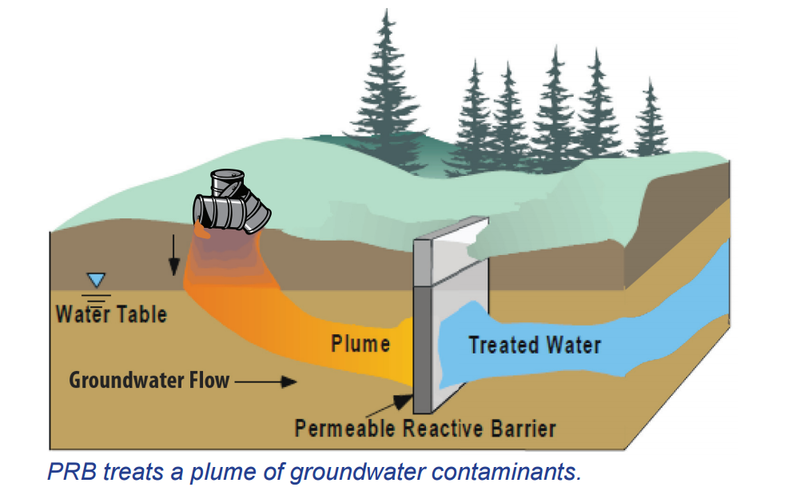 The anaerobic/aerobic permeable reactive barrier (PRB) system that was tested consisted of four different functional layers and was designed to remediate PCE-contaminated groundwater. The first (oxygen capture) layer maintained the dissolved oxygen (DO) concentration at <1.35 mg/L in influent supplied to the second (anaerobic) layer. The third (oxygen-releasing) layer maintained DO concentration at >11.3 mg/L within influent supplied to the fourth (aerobic) layer. Results show that 99% of PCE was removed, mostly within the second (anaerobic) layer. The toxic by-products TCE, DCE, and VC were further degraded by 98, 90, and 92%, respectively, in layer 4 (aerobic). The anaerobic/aerobic PRB thus could control both PCE and its degradation by-products. Tetrachloroethylene is present in the subsurface at contaminated sites, often as a result of its inappropriate disposal and release from dry-cleaning and degreasing facilities or landfills.